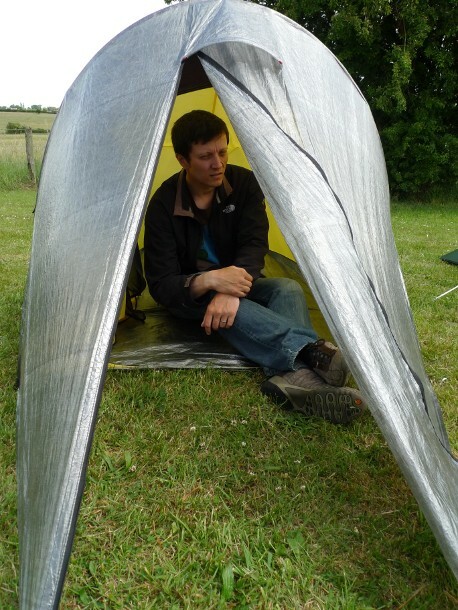 I managed a successful first pitch of the Trailstar this week in a friends garden. Not perfect by any stretch of the imagination, but not bad either. I am sure that with practice I will get better. Whilst it was pitched I took the opportunity to seal the seams, mixing the Silnet with white spirit to make it easier to apply. 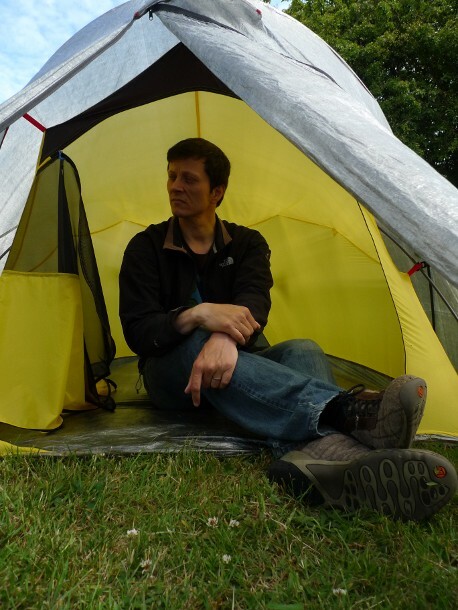 The seams on the Trailstar are less than perfect, a couple of them being crumpled and not very flat. They are also a couple of loose threads. I am hoping that this is cosmetic and does not cause any weakness. It also made it a bit harder to seal those seams. Anyway this shelter is huge inside, considering how small a package it is inside its stuffsack. When erected I found it difficult to reach some of the higher seams to seal them, standing on tiptoe with arms outstretched. This would be impossible if you are under 6ft! 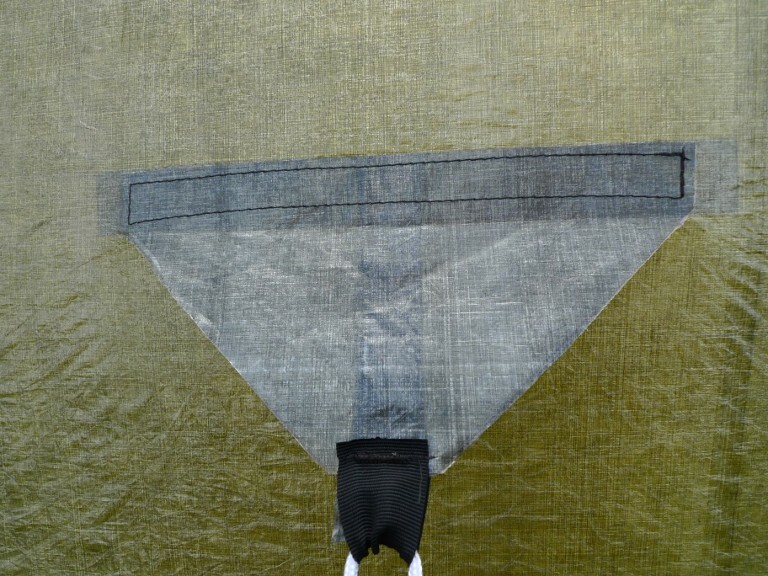 A bathtub groundsheet is on its way to me from Bearpaw Wilderness Designs. In the meantime I have got a heavier cheapie from the Poundshop. I am not sure yet whether to purchase an inner, I will see how I get on without one first. 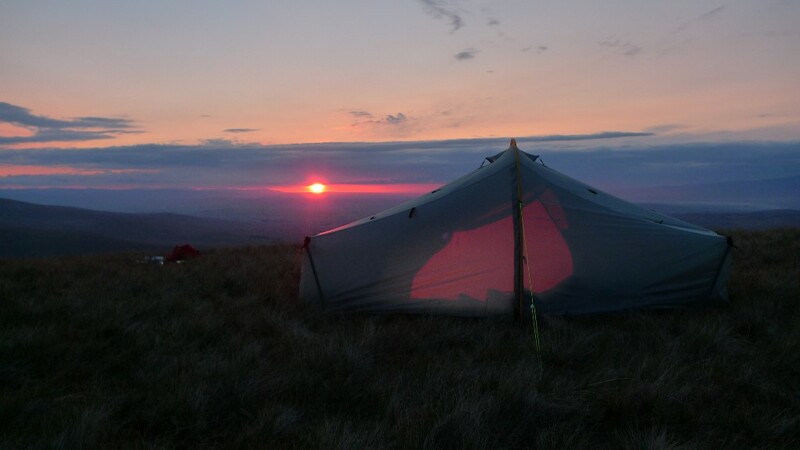 The Trailstar’s first outing is tomorrow and it will also be Reubens first backpacking trip. This has prompted some thought about his comfort and enjoyment. It is also going to add a bit of weight to my rucksack. For sleeping I have purchased him a foam mat from the Poundshop, this will be folded over for him. For warmth he has a smart pile lined jacket which makes him walk like a robot when I put it on him. I will also be taking an old fleece sleeping bag liner just in case. Each evening this week I have been putting the foam mat on the floor with the fleece liner opened out on top. He lies on it and I zip him in with only his head popping out. Last night he slept in it for hours snoring away whilst we watched T.V. So at least he is familiar with that set up. Add to that his bowl, a flexi lead, food and extra water, my ruckasck will be pretty heavy. 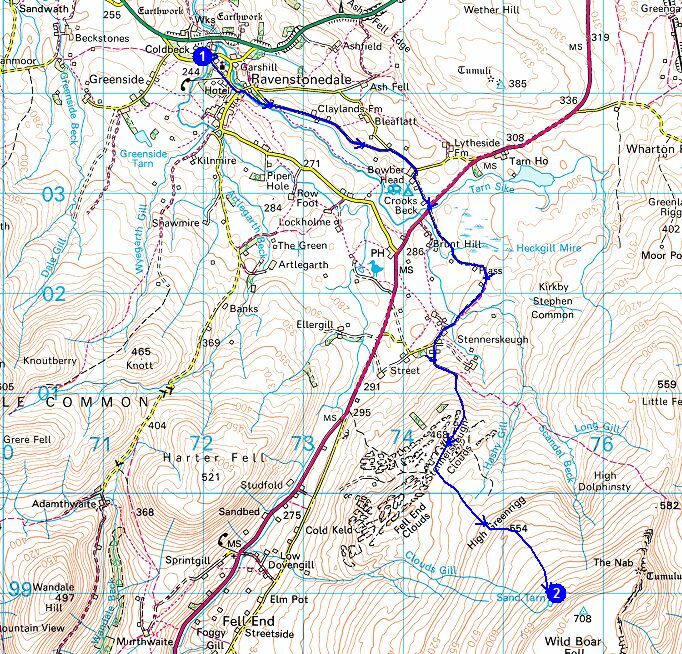 The plan tomorrow evening is to park up at the summit of a road at 500m and walk a kilometre or so to pitch well out of sight. 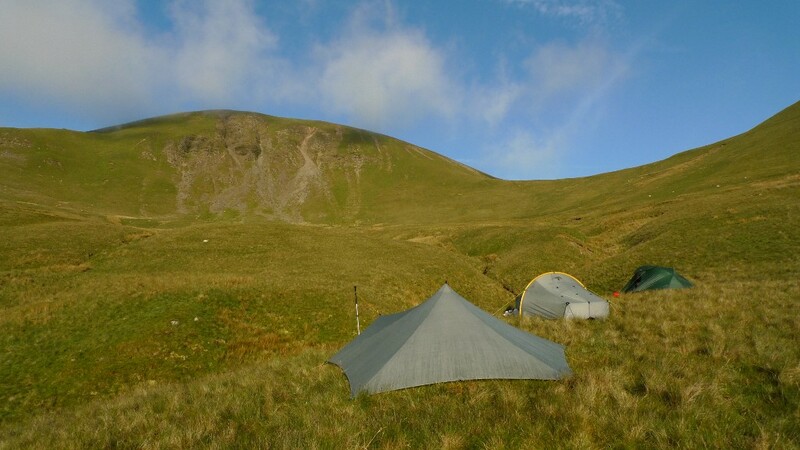 Fingers crossed it will not be too midgy at that height for a night in the Trailstar. If it is I will have a Terra Nova Voyager in the boot of the car for back up. The following day a short drive to Dufton for a two-day backpack in the North Pennines. It’s going to be a backpack with a difference! 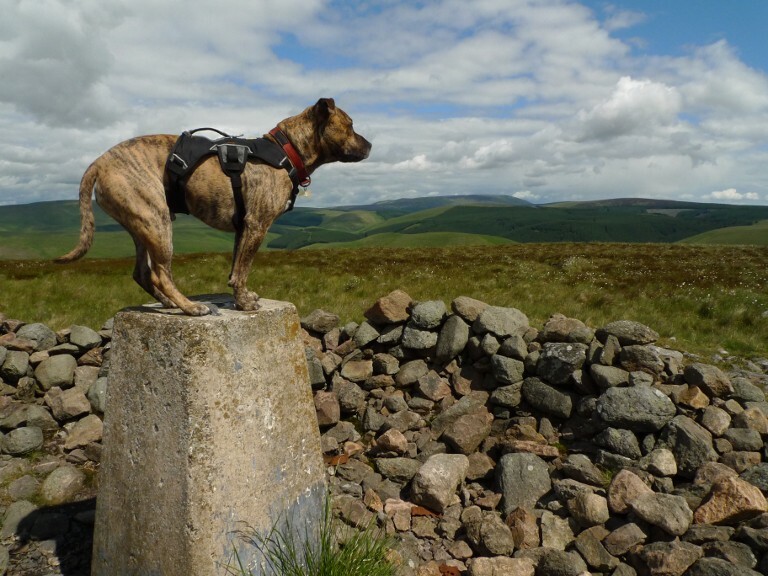 Talking dogs and backpacking I have just come across Dixie – a dog on the Pennine Way. An enjoyable read as you don’t get many people writing about backpacking with a dog. It’s easy to make grand outdoor plans, much easier than putting them into practice. The plan was to drive to Northumberland straight after work in the Bongo and find a quiet spot out of the way for the night. When it eventually came round to it I really could not be bothered as work had knackered me out. I got home and procrastinated which meant that it was nearly 8.00pm by the time I loaded Reuben into the van and headed north. The flow of the long journey was interrupted by a section of the A1 being closed, an hour being added to the journey. It was 1.00am by the time I pulled into a remote forestry car park just outside the village of Holystone, ignoring the ‘No overnight parking signs’. It was pitch black and the air completely still as I took Reuben for a quick walk in the forest. I immediately felt a million miles away from the stresses of work earlier that day. It was whilst sorting out the sleeping arrangements in the van for Reuben and I that the helicopter started. The sound of a helicopter buzzing overhead is a common occurence where I live, but in the middle of Northumberland? Soon after the heavy artillery started booming away, then in quick succession there was a loud rapport of machine gun fire. Checking my map I realised that I was parked up only a couple of miles from the edge of the military firing range. They were obviously doing night training and it was loud, very loud. How does the village I had just driven through cope with the racket? Reuben was unhappy, not only was it his first overnight trip in the van but he was being asked to sleep in the middle of a war zone. He put on the saddest face a dog can possibly make and tried to lay directly on top of me. That was uncomfortable so he was ordered to lay on one the seats. He jumped up there and looked even sadder. Unsurprisingly I did not sleep very well that night. It was a beautiful sunny morning as I drove through the Coquet valley past the small village of Alwinton. Here the road narrows and twists and turns its way deeper and deeper into the upper reaches of the valley. 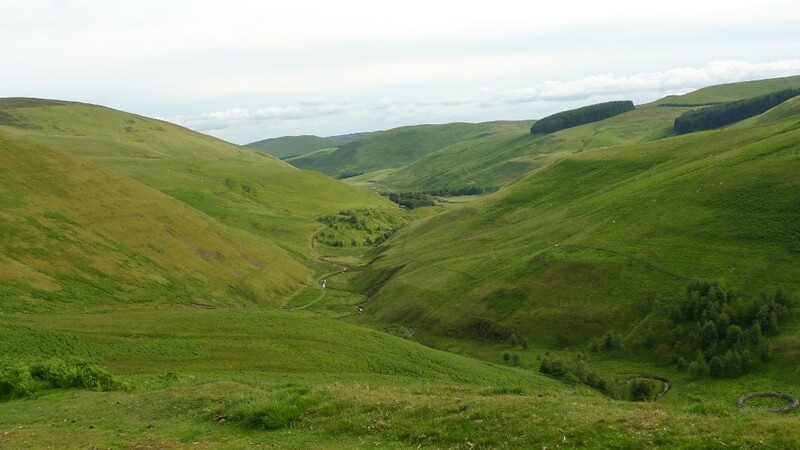 A truly remote area of green rolling hills, even on the road you feels you are in the middle of nowhere. I parked at the Wedder Leap car park, saddled up the dog and headed across the river and past the camping barn at Barrowburn. 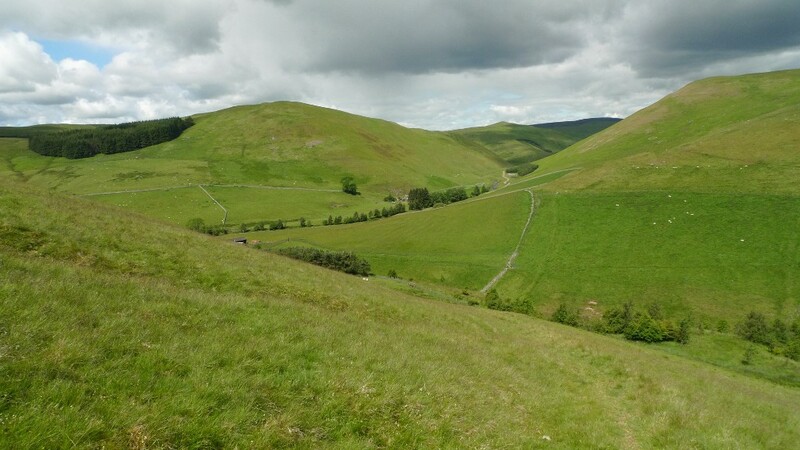 The first objective for the day was the isolated summit of Shillhope Law, the path to the top giving views of the gently folded landscape. The Cheviot hills can hardly be called dramatic. However what they lack in drama they certainly make up for it in terms of wide open spaces. The rolling grassy hills fill the horizon, broken only now and then by artificial forestry plantations. It’s a place to stride, hands in pockets and listen to the skylarks singing overhead. 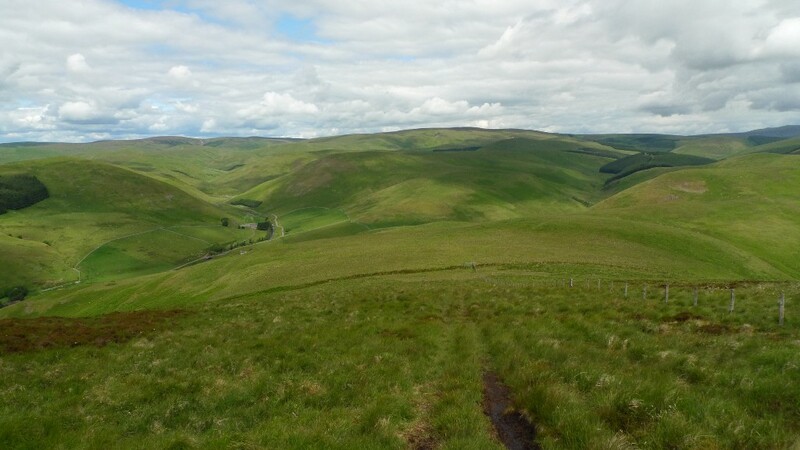 You can see why Northumberland is the least densely populated county in England, for here in these hills you really feel that you are alone. Thankfully they are in England and in a National Park. I would imagine that if located in Scotland they would be covered in giant windmills. The border itself was only a few miles away, I would set foot in Scotland the following day. 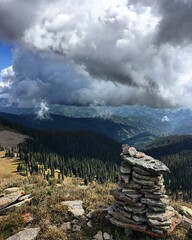 The summit is a place to linger and take in the landscape, completely unmarred right up to the horizon in all directions. It was clear enough to see the sea and I sat by the trig and enjoyed the warmth of the sun. 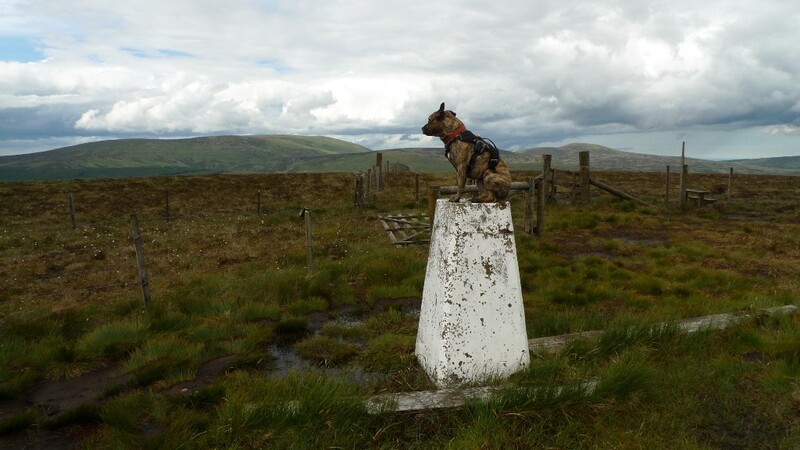 Reuben obliged by posing on the trig itself. The military however had plans that day and the peace was shattered once again by the thud, thud, thud of something being exploded. First would come a whistling noise and then a huge bang. We headed further east to get some peace and quiet. 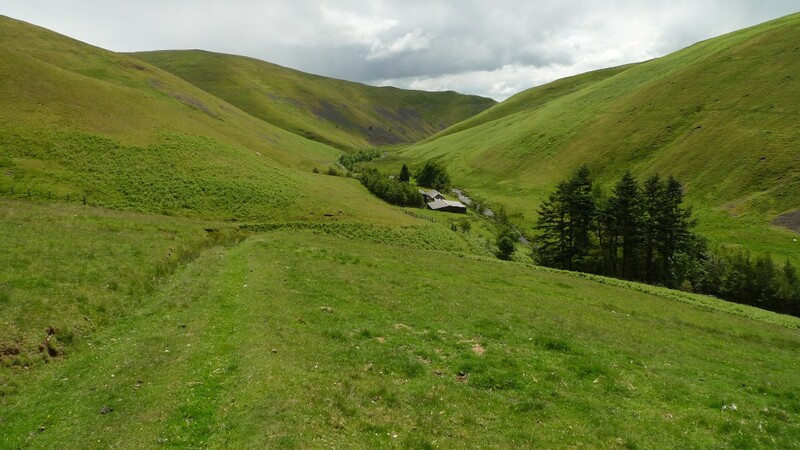 A steep descent to the Usway burn which was easily crossed dry-shod led to the remote farm of Batailshiel Haugh, an ugly bungalow set in a sublime valley. I kept glancing back as I climbed the easy grassy track on the way to Clennel Street wondering if someone lives here full-time. The next hill was to be Yarnspath law but on my initial attempt at leaving one track to get onto another I had to retreat. The marked footpath simply did not exist, the way being barred by dense new conifers. A few hundred metres of back tracking to get round a very short obstacle. 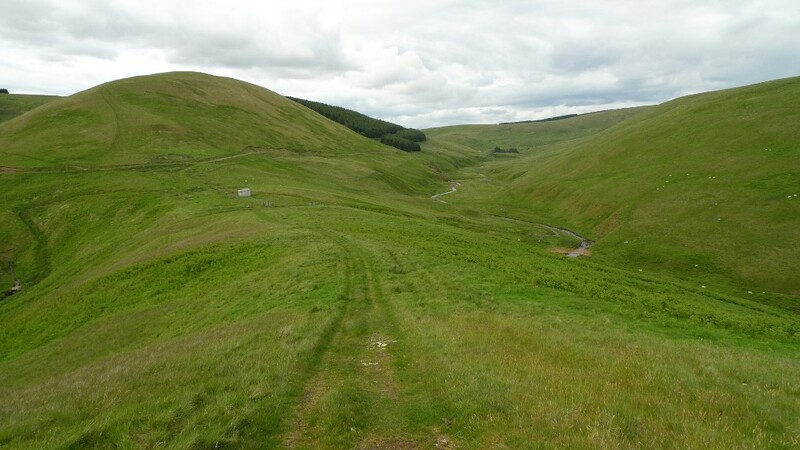 The open moor of Yarnspath Law itself was horrible, almost unwalkable. 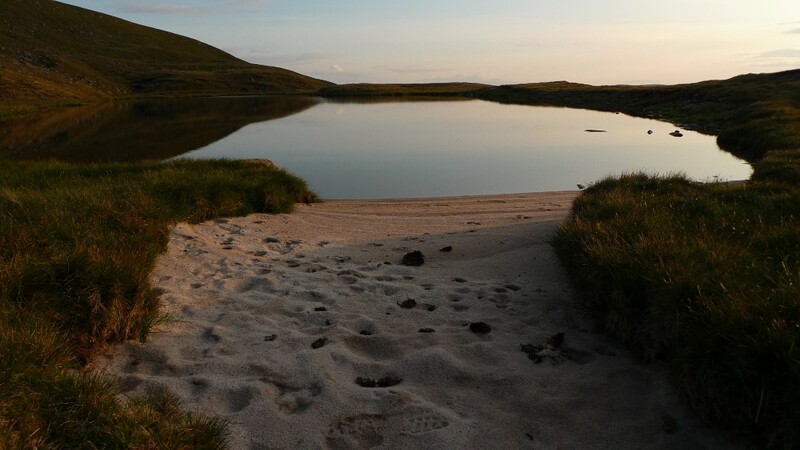 It was made up almost entirely of deep heather, giant tussocks and numerous hidden holes. 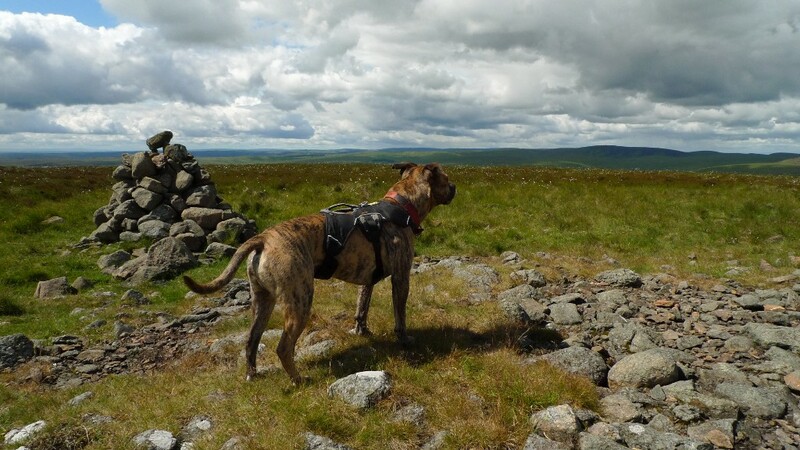 I lurched rather than walked to the summit, even Reuben had trouble, often faced with a wall of impenetrable vegetation. 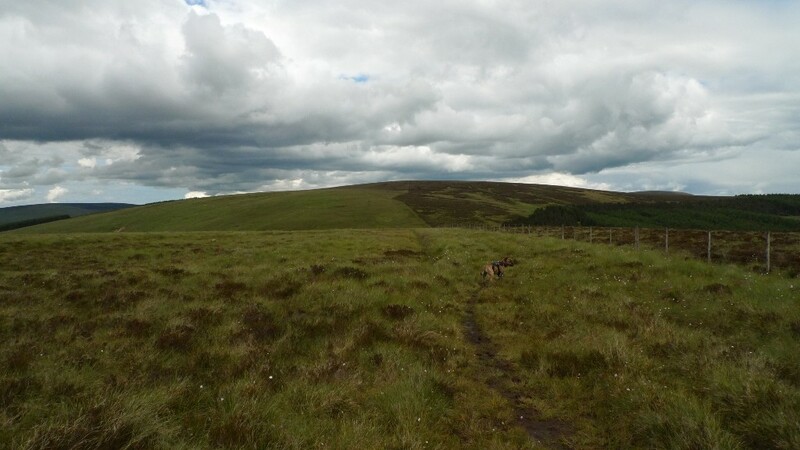 Thankfully there was a narrow path of sorts headed in the direction of the highest point of the day, Bloodybush edge. 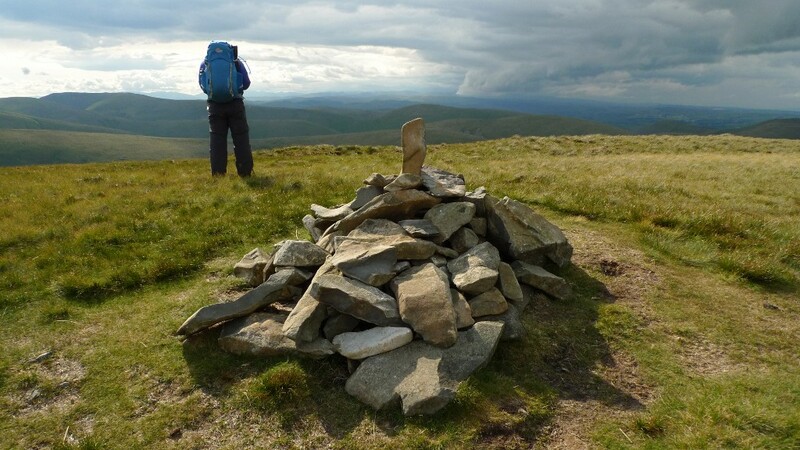 This is the only 2000ft peak in the Cheviots I had not climbed, forming the main objective for the day. 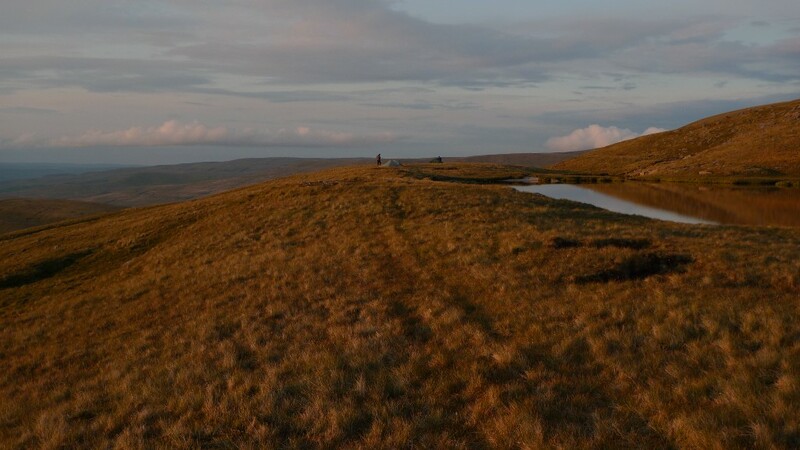 The summit itself was not the most endearing of places, covered in soggy bog and collapsed fence posts. I briefly managed to get Reuben to sit on the trig for a few seconds for a photo, his ears flapping in the now strong wind. 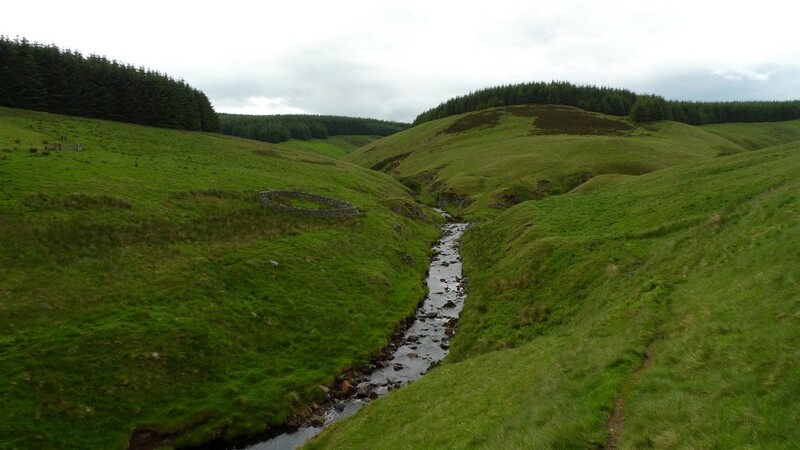 A soggy squelch across the moors brought me to the head of the Usway Burn, the views muted in the gathering gloom. 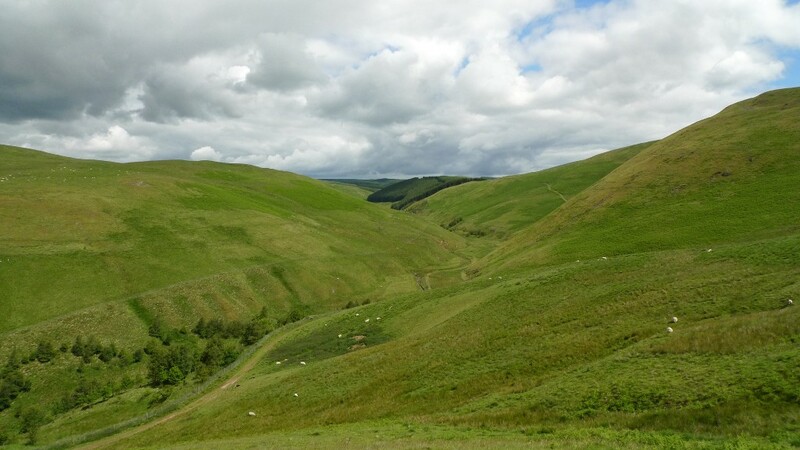 However I was still struck by the emptiness of the landscape, soft hills seemingly rolling on forever. 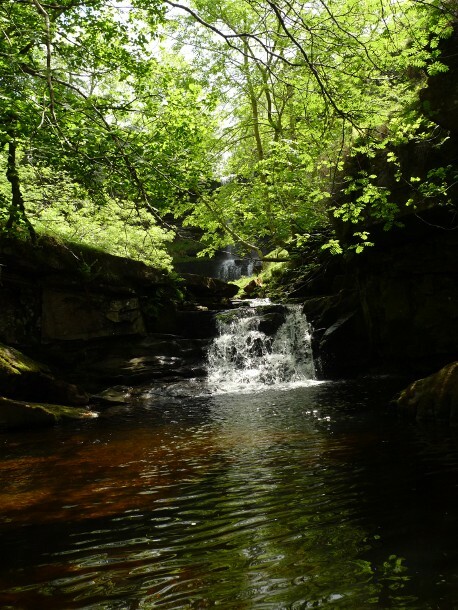 I had planned a visit to Davidson’s Linn, a waterfall hidden in the forestry plantation, a place where I have wanted to wild camp for a while now. However it was now drizzling so I found a spot next to the river to sit for a while and finish the food in my rucksack. Unfortunately the midges were making the most of the still, humid air and they drove us quickly on. 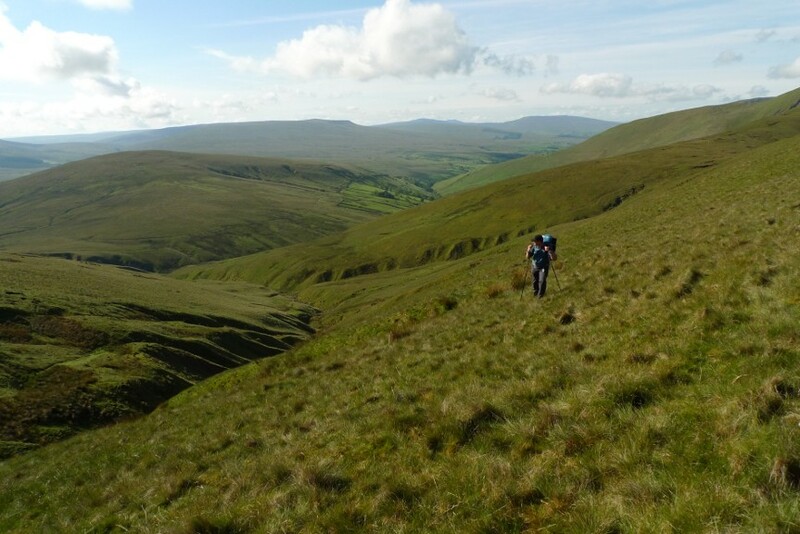 Uswayford farm is well known as a stop over on the final long leg of the Pennine Way. 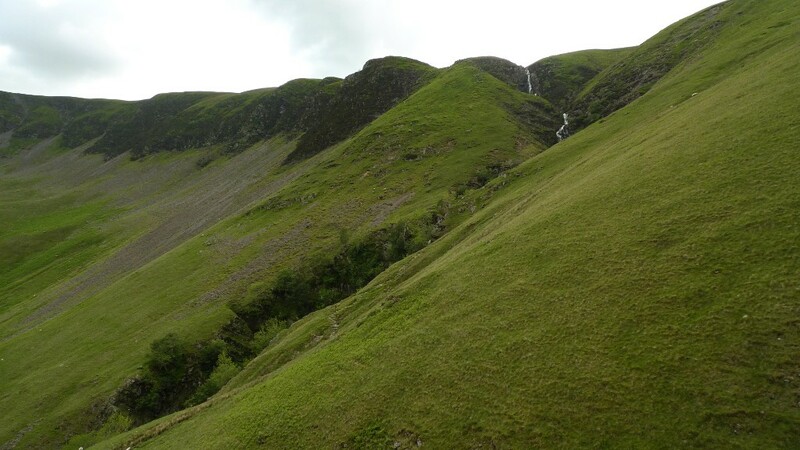 I have read stories of its mischievous owner telling tired walkers that they are in the wrong valley just to see the reactions on their faces. I have since read that those owners have now moved on, the property as far as I know now laying empty. 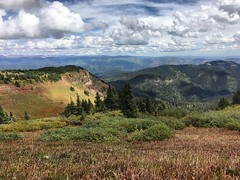 It is miles to the nearest road from here, even when you reach the road it is a long drive to the nearest village and then even further to a small town. I would imagine that it would be isolating to live here permanently, although I would love to give it a go for a few weeks. The aptly named ‘The Middle’ is a small hill that separates two steep valleys and gives good views down along the lengths of both. Following the bridleway through the forest I was soon high above the Hepden Burn on probably one of the best paths I have ever walked on. Soft and grassy underfoot it contoured beautifully above the valley, loosing height only gradually. One of those rare paths that would be a pleasure to walk in bare feet. Nearing the road I passed the only two hikers I had seen all day, a man and teenager were heading into the hills with huge packs which looked exceptionally heavy by the way that they were walking. Thankfully the Bongo was where I had left it. I drove a few miles further up the remote valley and parked up just past Blindburn at Buckham’s bridge. I ignored the ‘no overnight parking’ signs once again and settled down for a peaceful evening with just the dog for company. I had a pleasant surprise this morning when the postman knocked at the door. A package was handed over with my name on it, I haven’t ordered anything I thought to myself. I then noticed the return address on the package and realised it was my Trailstar, 5 weeks early. Brilliant. It has also got through customs without any charges being added, double bonus. The supplied cord has now been cut to length and attached to the line-loks. I went excitedly into the garden to get it pitched but hit a major problem. My garden is too small! 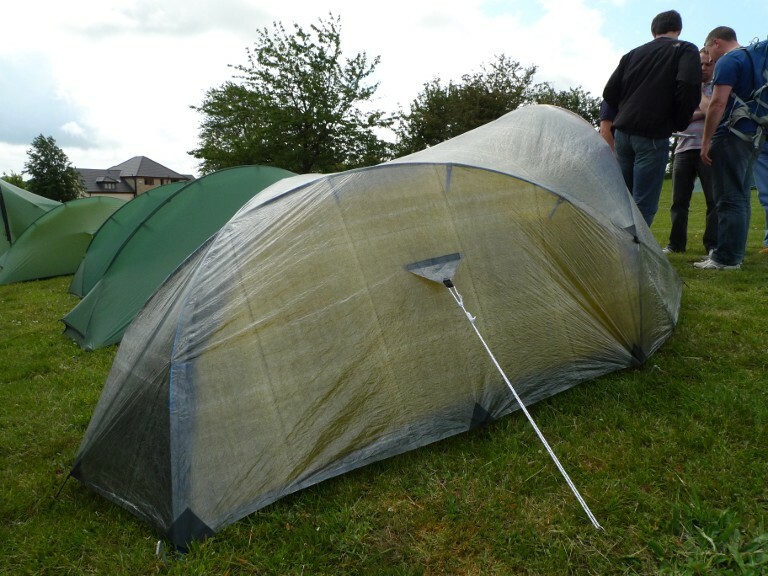 There is no way I can erect it even if I destroyed the borders, the Trailstar is huge. I am going to take it round to a mates house one night this week to have a play. I am planning a trip with it this weekend so will need to seam seal it, this will have to be done in my mates garden and left overnight to cure. Lets hope we have a dry evening and night this week. It’s good to have new toys to play with. 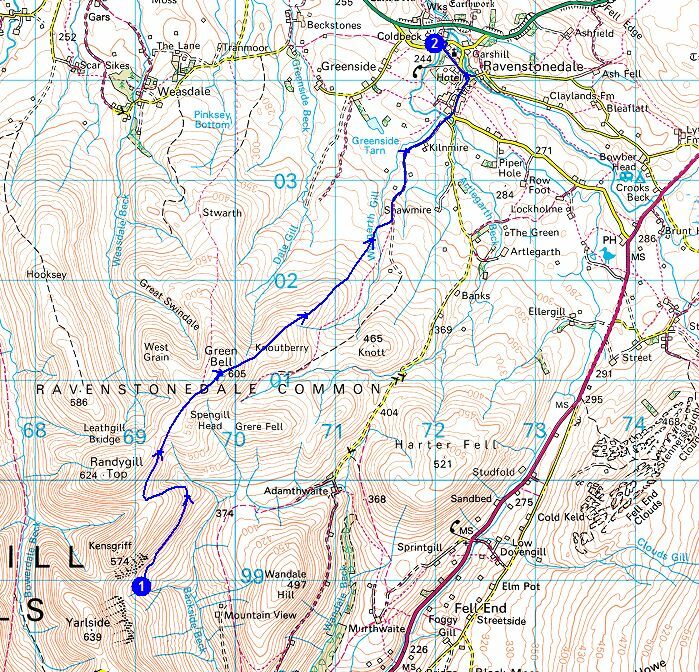 I did a couple of circuits of Ravenstonedale looking for a spot where I would be happy to leave the van for two nights. By the time I actually parked up I had no idea how my location actually related to the map. I feel a bit ashamed to admit that I powered up the mapping on my iPhone to determine my exact location. 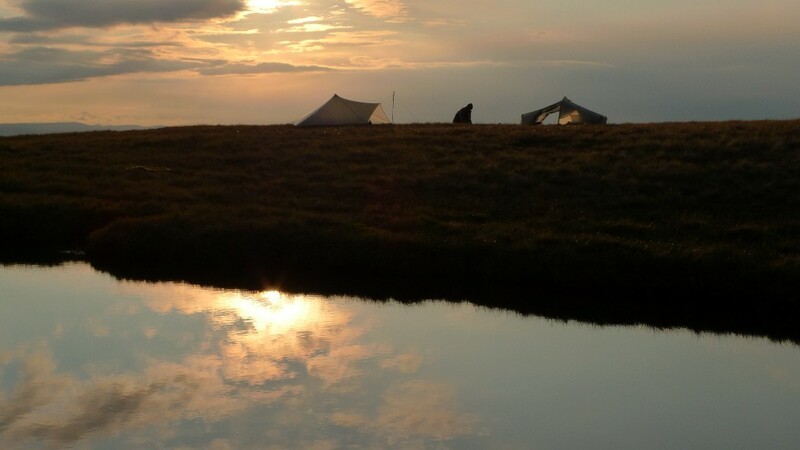 It was early afternoon and I had arranged to meet Martin and Terry at a high level camp later on that evening. I had previously backpacked with Martin and we had got along well, I had yet to meet or speak to Terry. However after reading his blog and watching his videos for a while now I had a firm image in my mind what he would be like. He lived up to those expectations in the flesh! With my map now following the reality of what was on the ground I located my first footpath with ease and crossed a field. 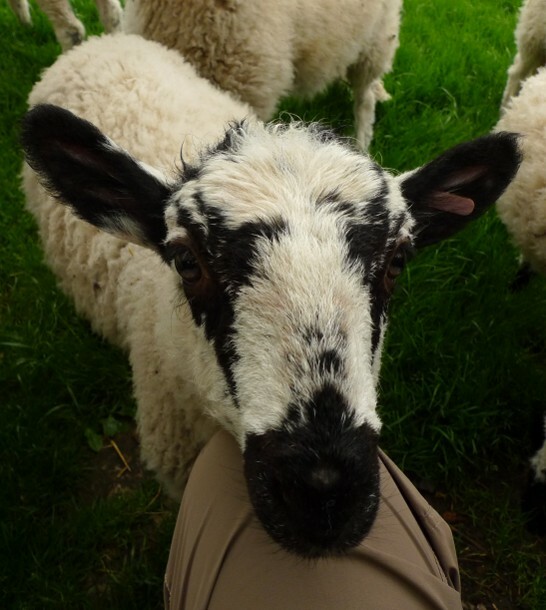 I was immediately surrounded by the friendliest lambs I have ever come across. They all crowded around me, pushing and shoving to see who could get the closest. One even nuzzled my knee and was up for a good stroke. This put a big smile on my face as I made my way along lanes to the A863. The weather however soon removed my smile as I fully kitted up in waterproofs whilst watching the clouds get lower and lower on Wild Boar Fell ahead. 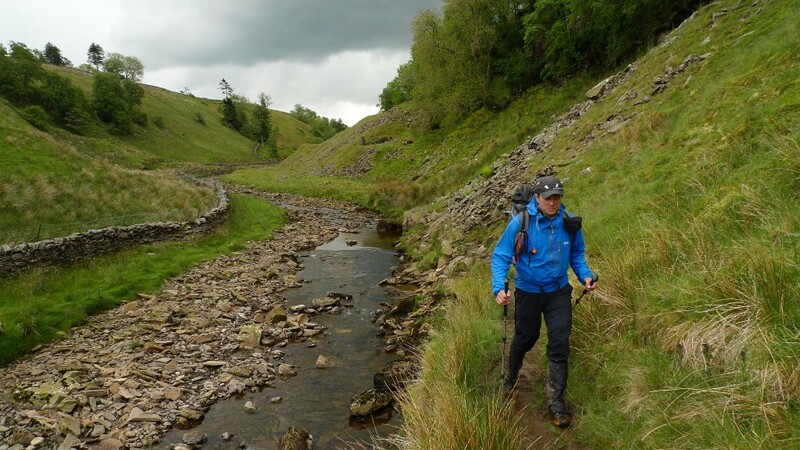 A steady drizzle soon gave way to a downpour on my climb up the bridleway that eventually leads to Mallerstang. I found temporary shelter under a band of trees and stood watching the cows as I loaded up on fuel for the long climb ahead. From the Limestone pastures of Stennerskeugh Clouds I looked towards where Sand Tarn was located, hidden from view by the mist. 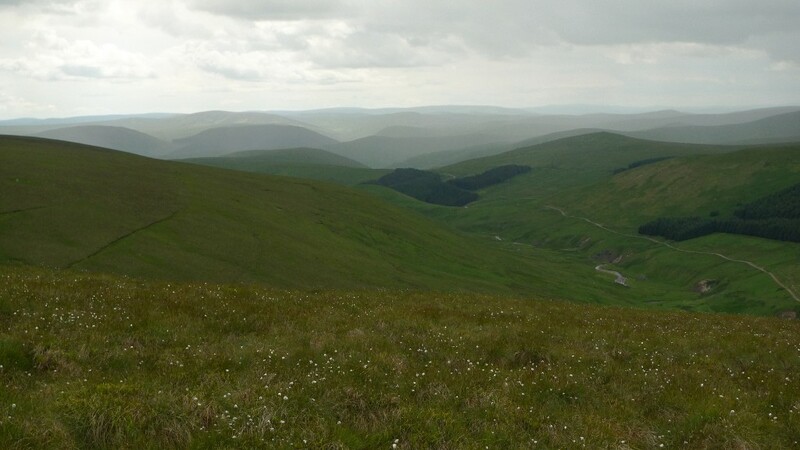 I took a bearing to a cairn on the horizon and descended across marshy ground before ascending the grassy hillside. The clouds were lifting by the time I reached the tarn, ragged tendrils drifting across its surface. It looked a dark and foreboding place the shifting mist providing a gloomy atmosphere. I located a spot for the tent, pitched up and laid down for a while. My empty thoughts were soon disturbed by a brightening though the nylon and I peered outside to see the sun weakly piercing the clouds. 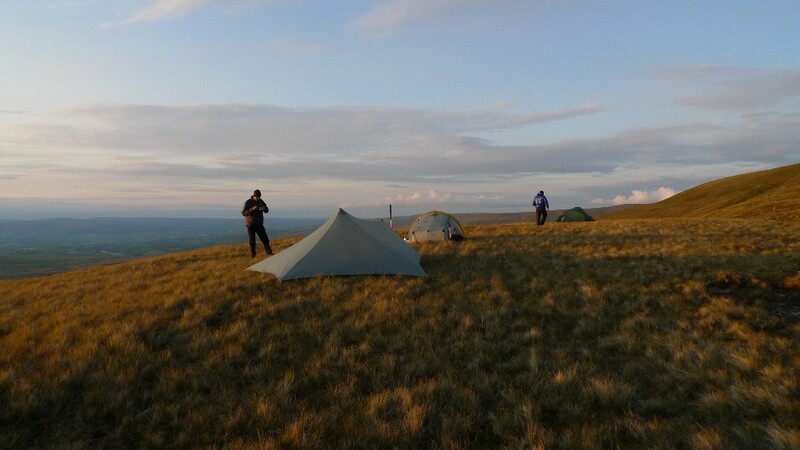 With a change in the weather came a change in atmosphere around my high wild camp, it went from dark and brooding to bright and friendly in less than an hour. I sat and cooked my dinner and and ate it on a rock overlooking my ascent route. In the distance I spotted two figures slowly make their way toward me, disappearing from sight every now and then as the moorland dipped. Finally Martin and Terry appeared over the final rise and wandered over to say hello. 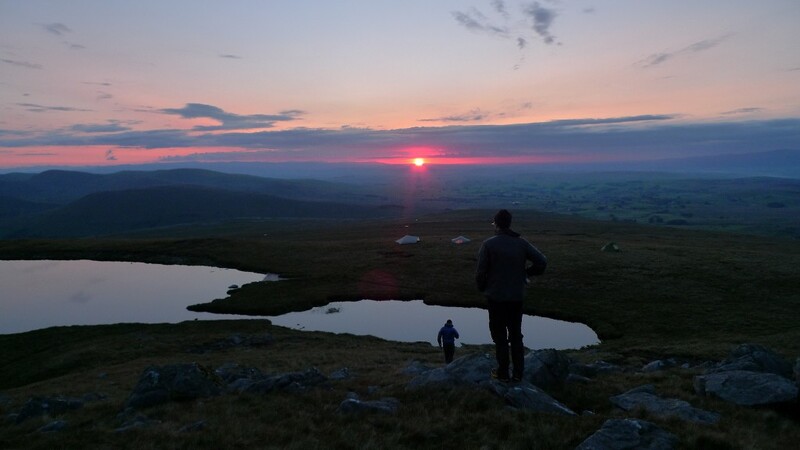 Tents and shelters were erected and we spent the evening in awe at the spectacle that nature laid on for us. The ever-changing light was magical as the sun made its slow progress towards the horizon. 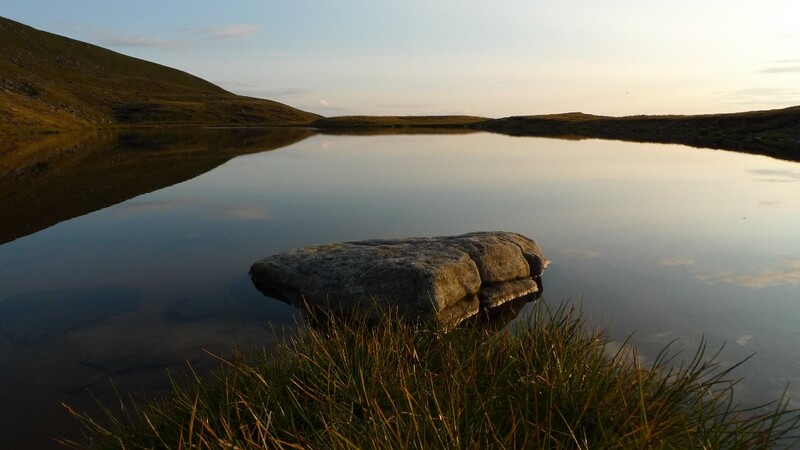 Sand tarn soon became a very inviting spot indeed. I think that we must have taken hundreds of photos between us that evening, it was hard to resist snapping away constantly. We wandered around camp for hours chatting about days in the hills and kit, pulling on more and more layers as the air chilled around us. Just before the sun finally disappeared from sight we started guessing what the temperature was. It felt cold, far colder than I have ever experienced in June. My watch left in my tent said that it was 3 degrees celsius. We were all glad we had brought along warm down bags that night. We had hoped, almost expected to wake to a spectacular inversion. Mist had started to form in the valley the evening before and the air had been clear and totally still. 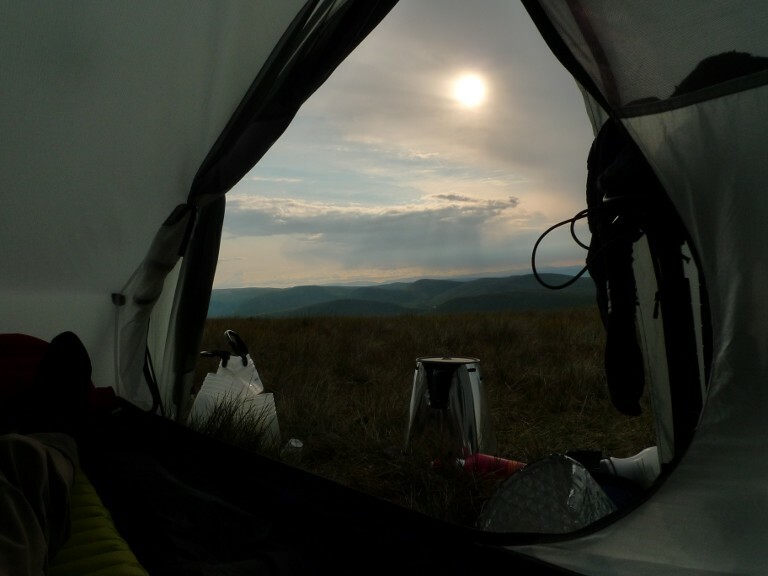 The inner of my tent was soaked with condensation, in some conditions this is totally unavoidable. 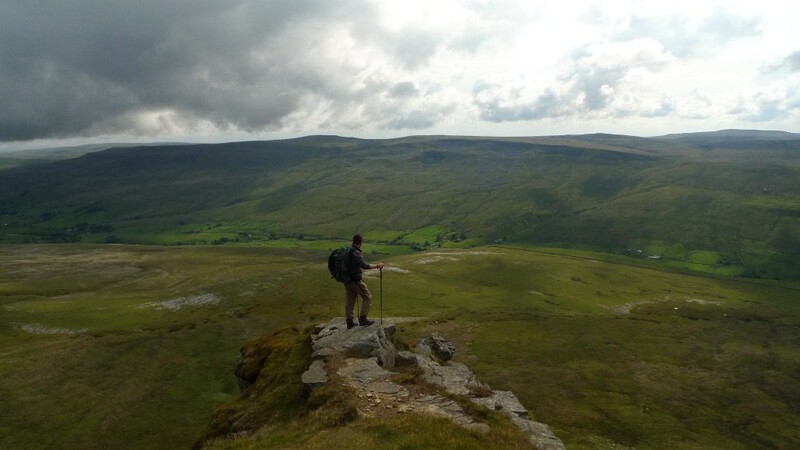 The climb to the trig point on Wild Boar fell was steep but short. A great spot but the best of the views are hidden by its extensive plateau. 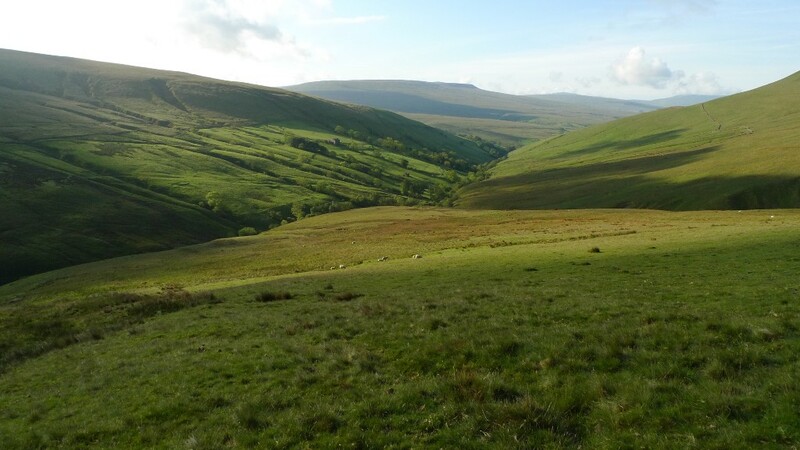 However a couple of minutes walk away the ground plunges steeply into the valley of Mallerstang. An outcrop of rock called the Nab is the perfect spot to stand and linger whilst taking in the views. 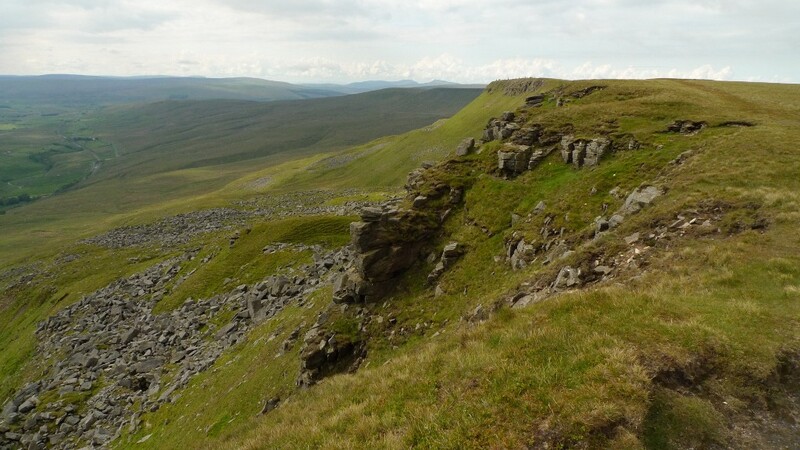 The eastern escarpment stretches for roughly a kilometre, bringing a bit of drama to the usual soft folds of the Pennines. 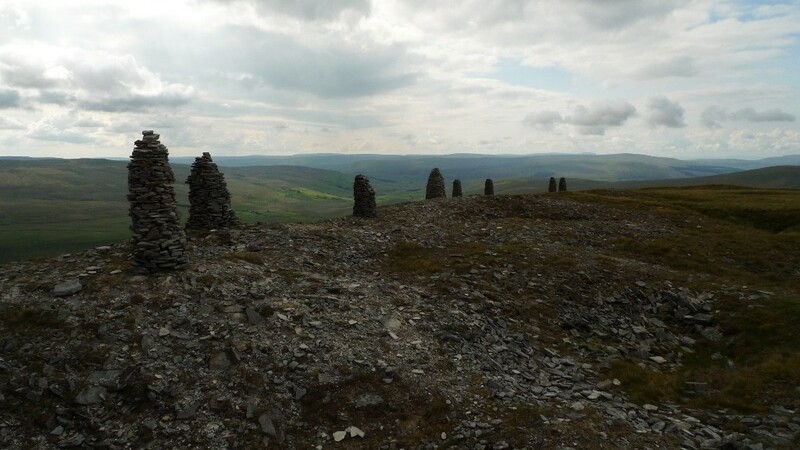 Tall slender cairns look like people standing by the edge from a distance. 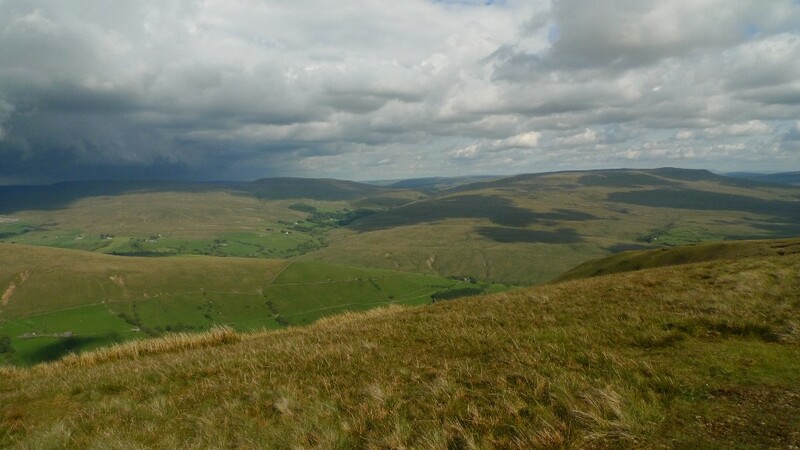 It was a relaxed walk towards Swarth fell, easy chatter about the stuff that backpackers find interesting, common interests shared. Lots of time to take in the wild and deserted landscape. 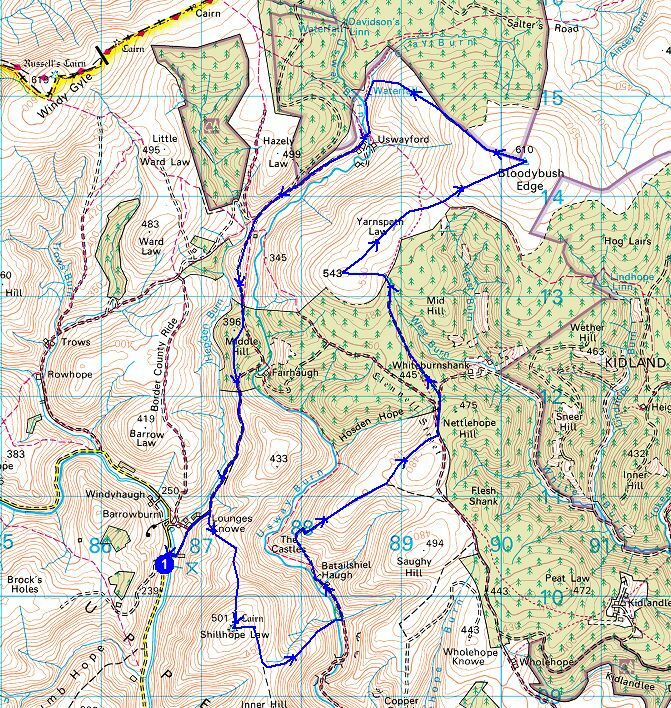 The original plan had been to ascend Baugh fell but we were all tempted to explore the hidden delights of Uldale, a world of gorges and waterfalls, hardly hinted at by the map. 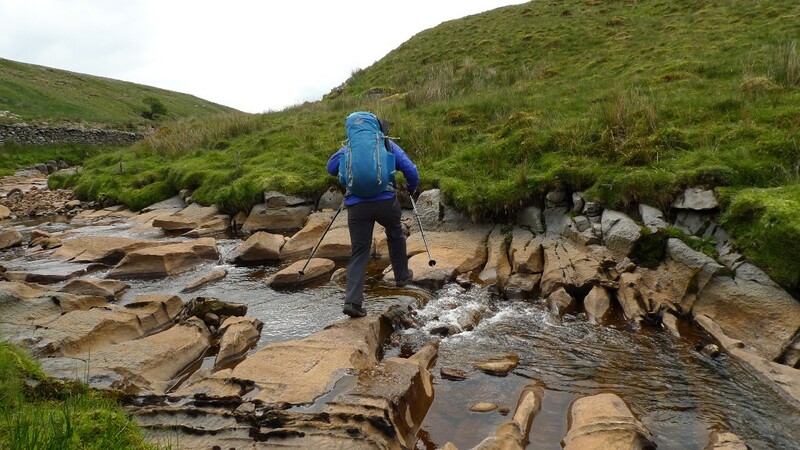 An easy grassy descent led to a crossing of the infant river, it was a case of ignore the map and seek out the best line down the valley. Terry had come this way before so took the lead. We contoured steep slopes high above the river hidden below. 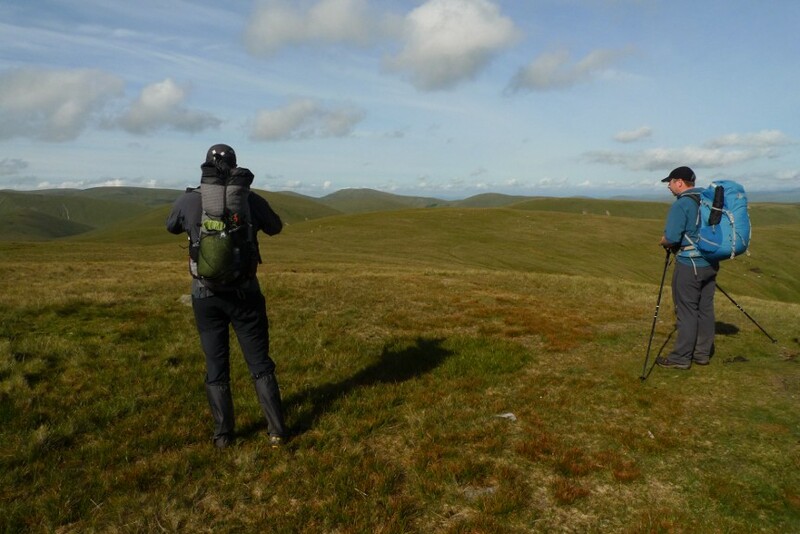 It was hard slow going, the calling then sighting of a Red Kite adding to the experience. Suddenly we were on the edge of a large sheer drop, the sound of a hidden waterfall below us. A steep descent and a bit of muddy scrambling brought us into a secret oasis, a deep pool surrounded by luxurious vegetation. A small cascade fell into the pool whilst behind, partially hidden from view a large waterfall plunged into a rocky amphitheatre. A truly lovely spot. Terry was the only one to brave a slippery traverse of the rocks above the pool to get a closer look. Food was eaten in the sun until a heavy shower got us packing and on our way. 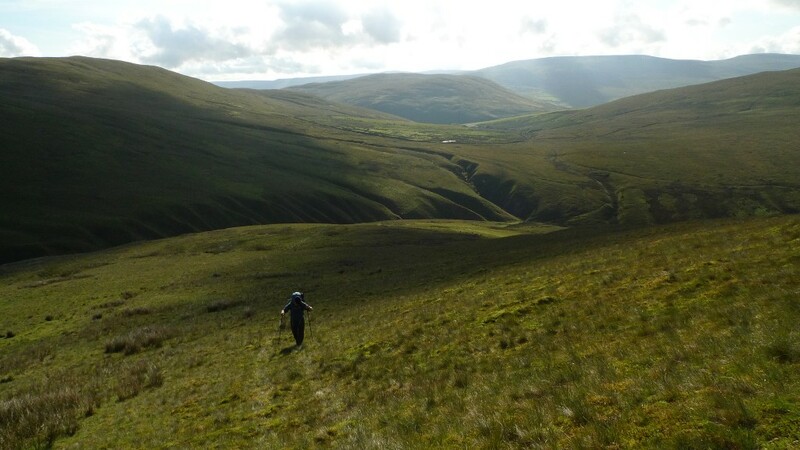 We stuck to the valley bottom as best as we could until a wide grassy bridleway lead us high above the Rawthey valley, the view towards the steep grassy Howgills becoming more dominant with every step. There was talk of food and ice-cold cokes on the descent to the road and it was suggested that we see if the Cross Keys Temperance Inn was open. Thankfully it was and we were soon sitting on the back patio with pints of coke and bowls of chips. 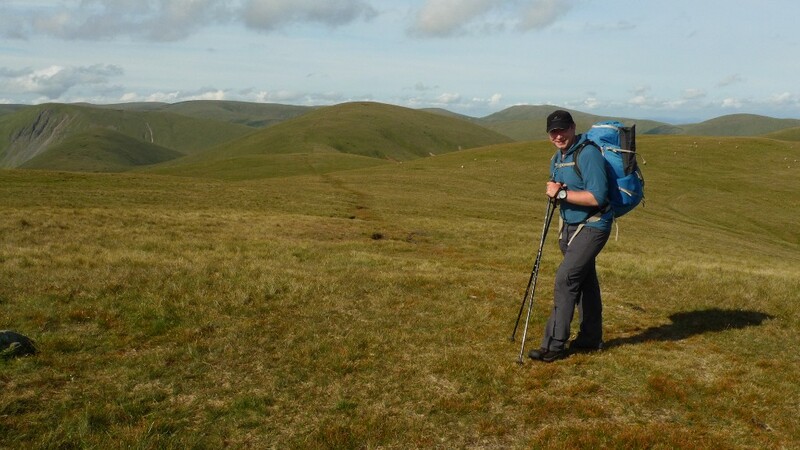 We were aware of the steep climb ahead of us to the summit of Yarlside, a hill that has a bit of a reputation for its exceptionally steep grassy slopes. 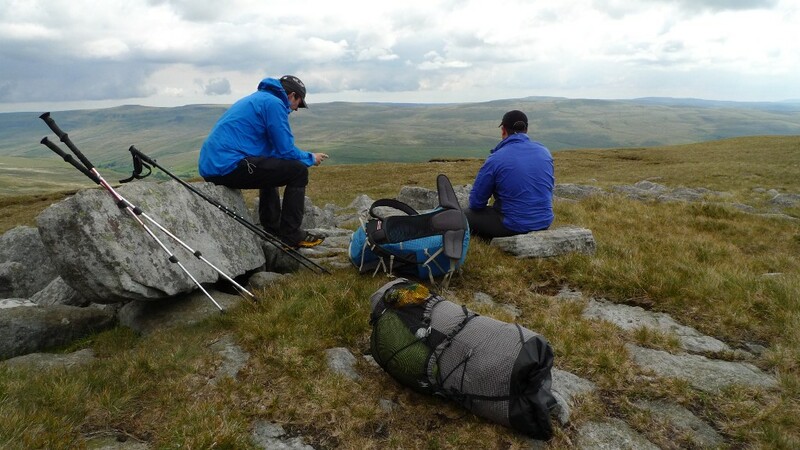 It can sometimes be difficult getting back up and backpacking after a good feed and sit down but we were soon making swift progress up the path towards Bowderdale Head. 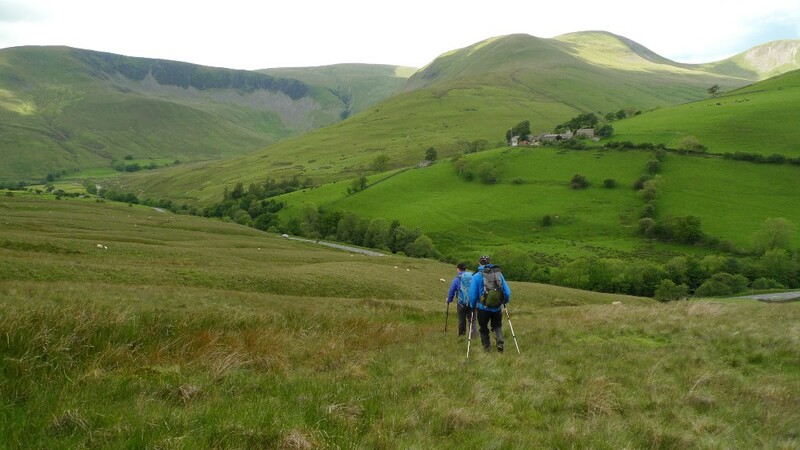 Cautley crags and the surrounding hills looked like they were covered in green velvet, the greenness of summer must surely have been at its peak? 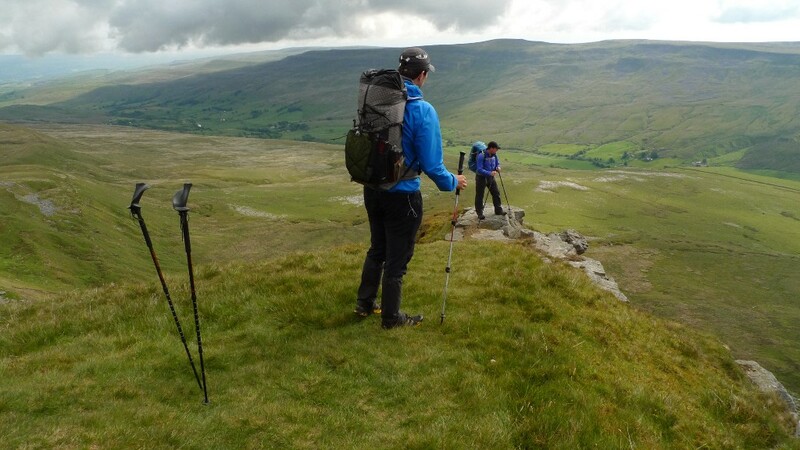 A group was passed at Bowderdale head and a guy made a comment that we must be sponsored by Rab. I have to admit that we were all pretty much dressed head to toe in the stuff! By the way I am not sponsored by Rab but if they would like to sponsor me………….. 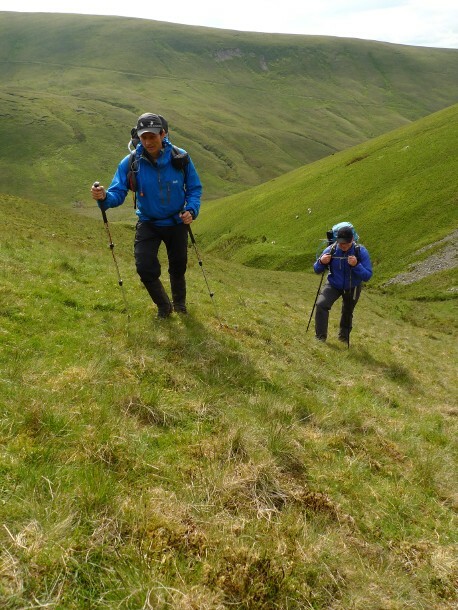 It was steep and slow going as we climbed Yarlside. 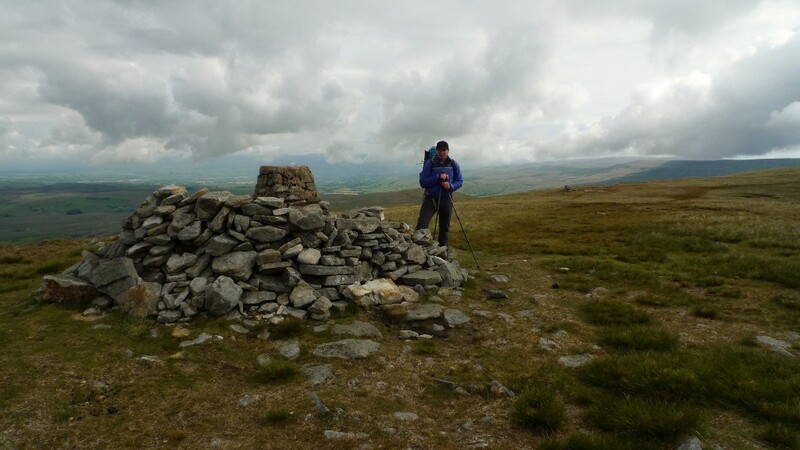 The summit gave amazing views of line after line of hills spreading into the distance. Looking west there was no suggestion of the hand of man, walls and fences being absent from this cracking little range of hills. The sky was moody and broody and we watched showers as they tracked their way across the landscape. 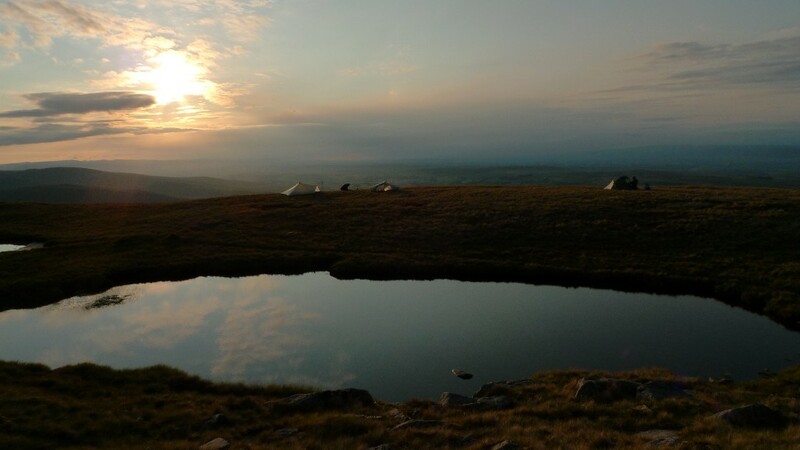 Terry made the suggestion of a camp high on the summit, to sit in our tents and stare at the views would be a great way to pass away the evening. There may even be another sunset treat. 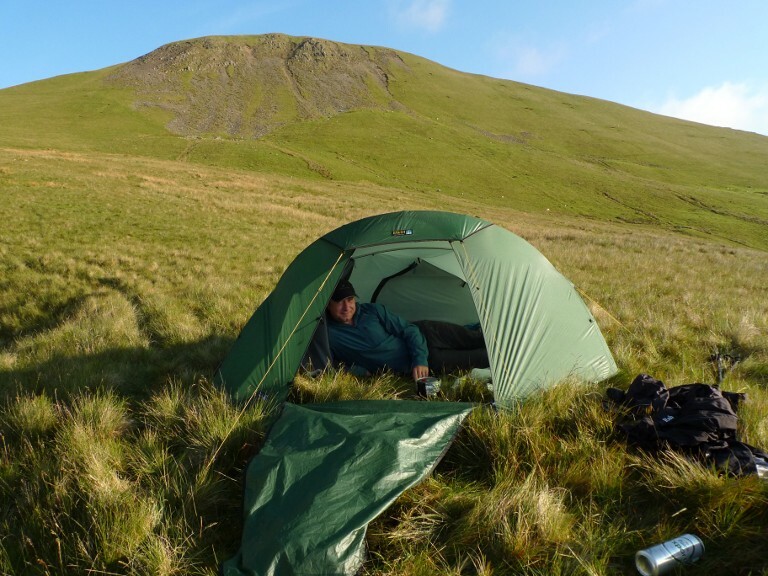 The wind however would have made it unpleasant and myself and Martin persuaded him that a sheltered camp would be a better idea, even if we lost the views. 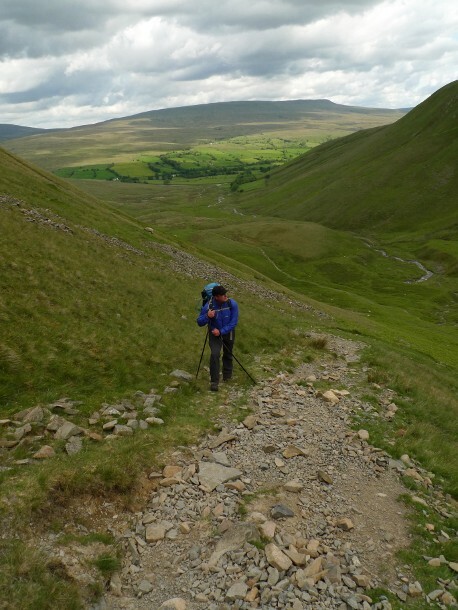 The descent to the saddle between Yarlside and Kensgriff is exceptionally steep. A slip in wet weather here could potentially be serious, you would slide down the cropped grass with speed. We descended in a row just in case someone did slip, that way they would not take anyone else down with them. 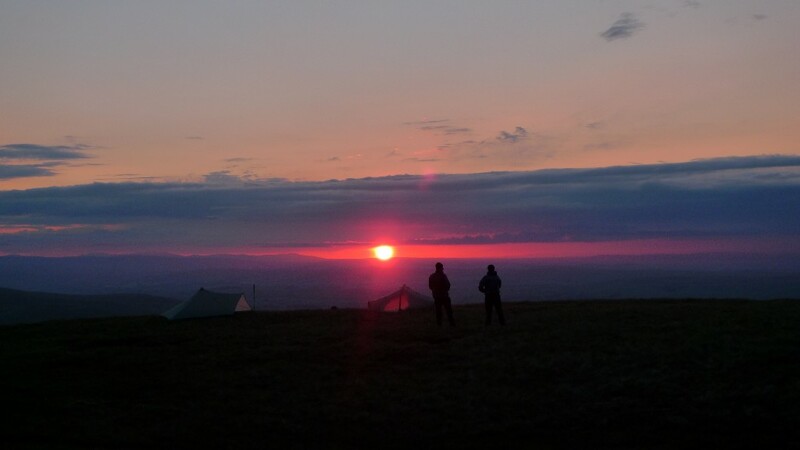 We were up and out of our tents by 6.00am. The cold and rain of the night before being replaced by a bright sunny morning, the warmth already being felt. A time to appreciate our camp spot, something we had not been able to do before. We were walking by 7.00am, something that I rarely do. The light soft and clear bringing out the textures of the surrounding hills. It was worth getting up early for. Various sheep trods helped us as we contoured along the steep slopes of Kensgriff. It was a steep pull in the increasing warmth to the col below Randygill Top. The ascent was best summed up by Terry. Once up high the walking along a good path to the trig point on Green Bell was easy. 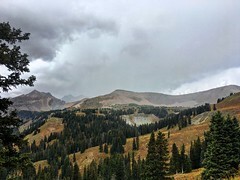 A last chance to take in this unique range of hills. I mapped out some future routes in my mind and we talked about the possibility of a backpack that took in all the summits. That would be a challenge, not so much in distance but in all the steep ascents and descents that would be necessary. I think that would make a cracking long weekend. 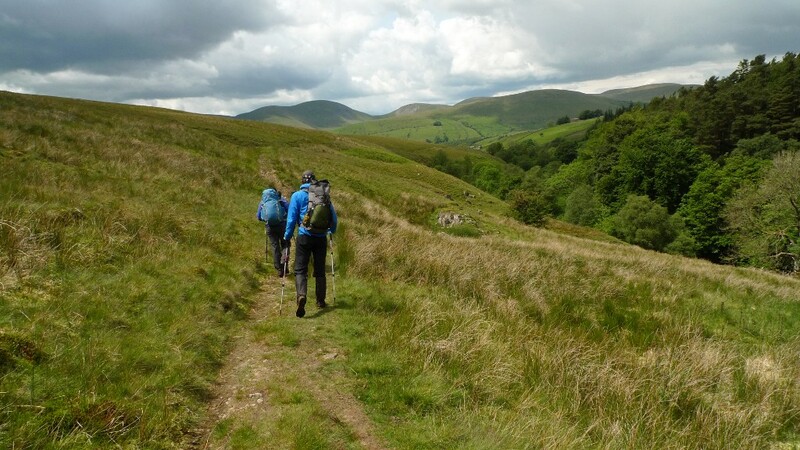 We left the path at Knoutberry and made our way down easy pathless slopes to Ravenstonedale. It was still early morning when we arrived at the village shop to buy cold drinks. The village looked idyllic in the summer sunshine. We were lucky to get such a perfect weather window that morning as on the drive home it tipped it down. All in all an enjoyable and relaxed backpack with good company. You can read Martin’s account of the trip here, and Terry’s here. Last month Terry, Martin and myself spent an afternoon with Terra Nova. For committed gear geeks it was a most enjoyable few hours. One of their reps spent a good hour showing us their product line, including a few that are brand new for next year. There were three products in particular that caught all of our eyes. A sign that a mainstream British manufacturer is finally catching up with what is on offer from ‘Cottage’ industries in the U.S in terms of design and materials? This is what grabbed my attention that afternoon. I have to admit that this is the first thing that I spotted amongst the rows of tents. Whilst the rep talked about each product in turn I could feel my eyes drifting further up the field. 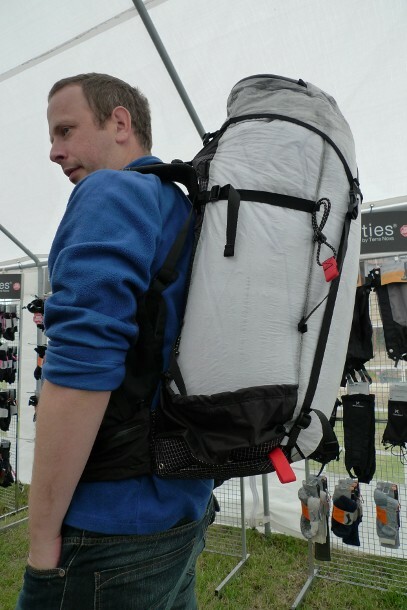 Basically it is the classic voyager but with Terra Nova’s new Ultra fabric (read Cuben?). What is astonishing is the weight with a stated 880g (min) / 920g (max). The claimed hydrostatic head for both the fly and floor is put at 10,000mm, most definitely waterproof! The dimensions are pretty much the same as the standard Voyager with the exception that it is 9cm narrower at its widest section. I would really like one but it is most definitely out of my budget at an estimated £1,200. Yes you read that correctly! Some photos below with Martin providing his modeling services. It is probably telling of our individual backpacking style when Martin was drawn to the Quasar 45 and myself to the Quasar 55. I loved the look of this pack and it was exceptionally light for the volume. Could this be a sign that Cuben may become more mainstream in the future? (and hopefully cheaper too). 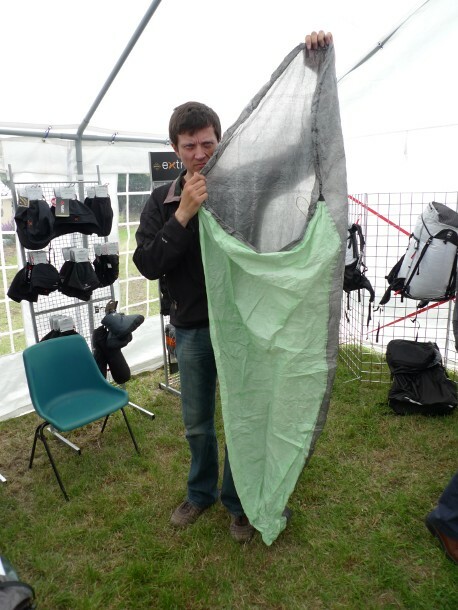 Made from their Ultra and Matrix fabrics it has an ample 55 litre capacity. The stated weight is 540g (Min) / 850g (Max). It has a PE back system with a single strut alloy frame. I think that the only thing that let it down was a rather flimsy hip belt, I would prefer to see something more substantial on a pack of this size. It will be interesting to see how they carry when fully loaded up once in production. 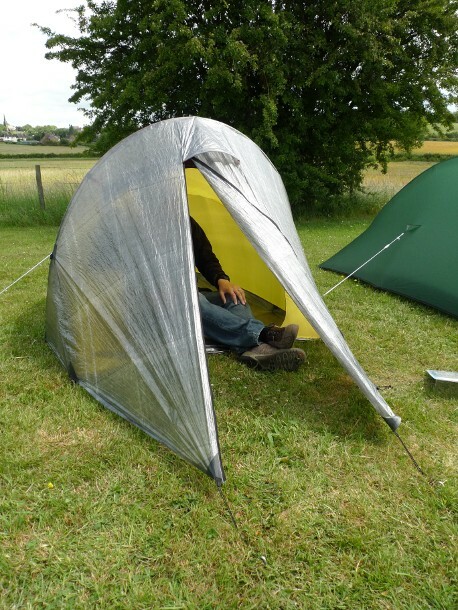 Out of all the tents that I could actually afford to buy, I think that this would be the one I would go for. 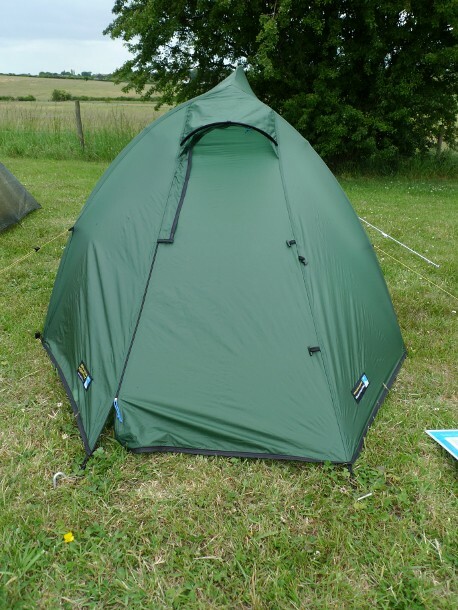 In my eyes it shares some similarities with those in the Big Agnes range of tents. 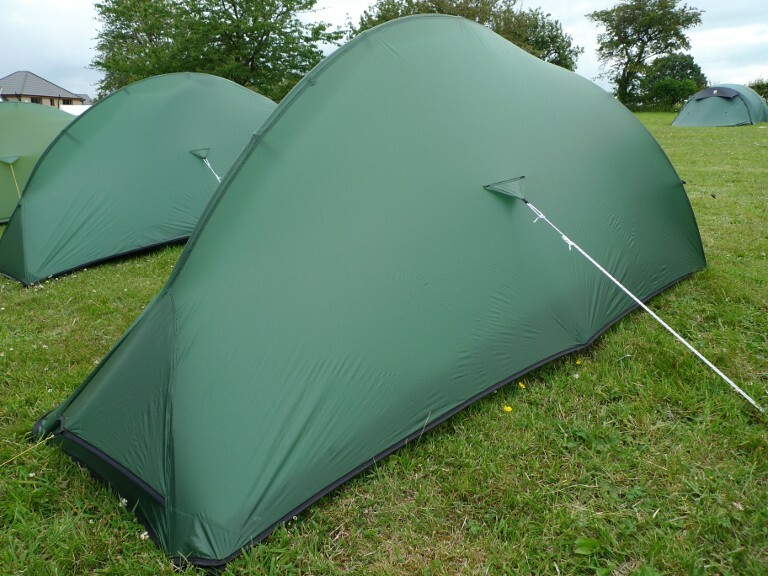 It is sold as a two person tent but I think it would be much better suited as a roomy one person backpacking tent. It pitches inner first and has a pretty distinctive profile, it will be interesting to see how it copes with a side wind. The weight is what would make this tempting at 1.1kg (min) / 1.17kg (max). Not much more than the classic Laser Competition but far roomier and in my eyes less claustrophobic. Tempting if I was ever in the market for a one person backpacking tent (I already have too many!). We spotted this folded neatly on a table and initially thought that it was a small stuff sack. 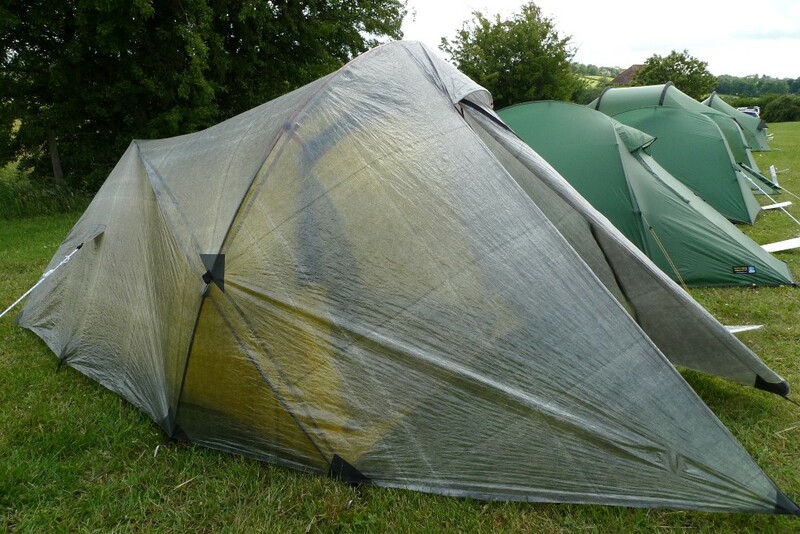 Further investigation and a bit of unravelling revealed a cuben bivi bag. This thing was light, really light. The cuben on the top had a texture to it that reminded me of the compostable bags I get for food waste. Terry was keen to see how strong this material was by attempting to push a pen through it, he was stopped just in time by one of the reps! It will be interesting to see this once in production. We all really enjoyed the few hours we spent there. The Terra Nova staff were very welcoming and patiently answered the barrage of questions thrown their way. It was good to have the company of Terry and Martin, thanks for the invite Terry. 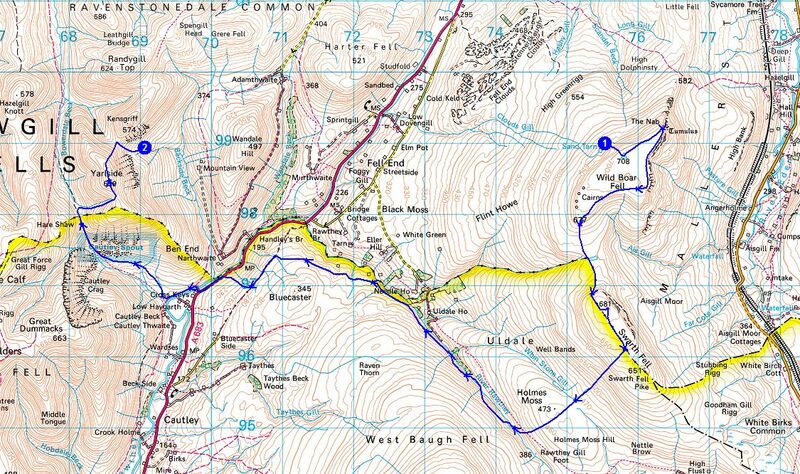 I’m sure that they will both do a write-up today, you can check out their blogs Terrybnd and Summit and Valley.